Adrian Peterson striding into the endzone. When we think of certain NFL records there are some that are held with mythic quality. We see them as moments we’re not sure we will see broken. After today’s 212 yard performance against the St Louis Rams, Peterson is within 294 yards of the all time record. In 1984, Eric Dickerson gained 2,105 yards in his second season and his record has only had 1 other rusher seriously approach it. That was in 2003 when Jamal Lewis gained 2,066 with the Baltimore Ravens. In that year he set the NFL single game rushing record at 295 yards rushing which came against the Cleveland Browns. It stood until 2007, when Adrian Peterson burst for 296 against the San Diego Chargers, and now he needs to average 147 over the last two weeks for the all time single season distinction. It’s quite amazing when you think about it. On December 24, 2011, Peterson tore both his MCL and ACL and his career was in jeopardy. The first thought was will he come back as the same back?? A legitimate question since the position of running back has had it’s history with players careers cut short or backs not bouncing back with the same physical abilities once a knee injury hits. However think about it for a second… he’s on the precipice of becoming the second running back in history to run for 2,000 yards in a season after reconstructive knee surgery. 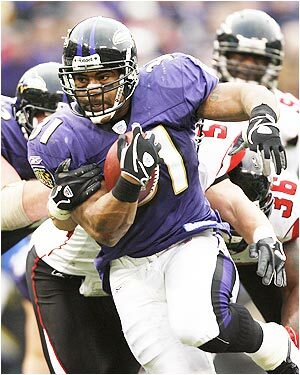 Remember Jamal Lewis in 2003 for the Baltimore Ravens when he ran for 2,066?? 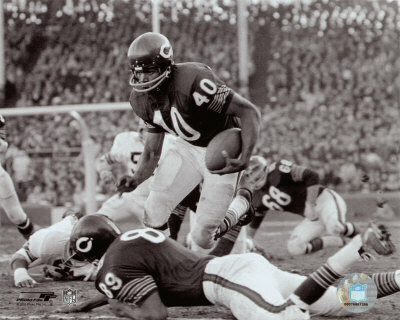 Let’s take this back to “The Kansas Comet” Gale Sayers. In 1968, his 3rd year he shredded his knee after Kermit Alexander of the 49ers undercut him. They used cat intestines to replace his ligaments and he was never the same player when he came back from injury. Sure he fought his way to a 1,000 yard season in 1969 but he was never the same player. His longest run was 28 yards that season. Gone was the sweet moves and burst that made Sayers a wonder to behold. Sports medecine in the 1960’s was in it’s infancy. Fast forward to 1987 when Thurman Thomas injured his knee at Oklahoma St. He had his knee reconstructed but his draft status suffered because of it. He was drafted in the 2nd round and had to play his entire career with a knee brace on it per Buffalo doctors. He was able to maintain the speed and crisp moves he had as he powered the Bills to 4 Super Bowls. He finished with 8, 1,000 yard seasons and was one of history’s finest all around backs and a Hall of Fame member. He was once MVP of the league and ran for 12,074 yards in his career and had over 16,000 total. Yet he had that bulky brace to help him maintain his physical abilities. Sports medecine was making some progress. We move to 2001 and the Super Bowl champion Baltimore Ravens had a bull of a back named Jamal Lewis. He was a big physical runner who ran with thunder. Yet he didn’t break really big runs. He did have several where he chugged it 30-40 yards for a touchdown after breaking a linebacker’s tackle. He had run for 1,364 yards as a rookie in 2000. He missed the entire season of 2001 after his knee was reconstructed. In 2002 he came back and started building momentum as he gained strength and confidence in the knee. When he hit full stride in 2003, he didn’t even look like the man from a few years before…he was better! Stronger, faster, and his burst looked like what folks envision when they think of Bo Jackson. In fact the most frightening display of power and speed happened in the 2nd game of the season. The Browns looked helpless as he ran for 295 yards to break Corey Dillon’s NFL single game rushing record. He had 5 runs of 50 or more and they just couldn’t tackle him. He powered for that aforementioned 2,066 yards and Eric Dickerson was sweating bullets in that last Monday night game. No knee brace just an offensive terrorist leaving defenses in ruin. Which brings us back to Adrian Peterson. 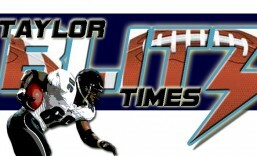 By the way, none of this has come to the surprise of Taylor Blitz readers because we alluded to this happening already. It’s common to compare Peterson to Jamal Lewis, for it was his NFL record he broke when he ran for 296 in a game v. the Chargers in 2008. However with his injury, Peterson didn’t need a full year off like Lewis and is hitting full stride less than 8 months after the injury. So will he make it?? For the season he is averaging 129 yards per game. Yet a closer look shows you in his last four he is averaging 171 yards per game. In one of those he gouged the Packers for 214 in Lambeau Field. What do you think he’ll do with a wild card playoff on the line in a finale at home against them?? He’s had two 200 yard games in the last three weeks and now he only needs 294 to pass Dickerson?? Adrian Peterson without a knee brace after reconstructive surgery is tearing the NFL apart. What you are witnessing is a transcendent talent leaving his contemporaries behind. Adrian Peterson is that rare back that comes along once every 20 years or so. He’s a future Hall of Famer and his recovery from reconstructive knee surgery is to be marveled at. Although a nod has to go to sports medical advancement on knee surgery improvements over the last 40 years. Peterson almost looks bionic with his knee, he looks like he has more burst than he did before, now that the season has gone on. What will he do next year?? The Chancellor knows one thing…. somewhere else in Southern California, Eric Dickerson is sweating profusely. This entry was posted in 2012 NFL Regular Season, 2012 Regular Season and tagged Adrian Peterson, Eric Dickerson, football, Gale Sayers, Minnesota Vikings, NFL, NFL History, sports, Thurman Thomas. Bookmark the permalink. Hey Jef , didn’t barry sanders have a knee injury late in his career and bounce back for some big seasons ?